spinning yarn like this, my fiber stash will last FOREVER. One of these two threads is my handspun merino singles for a laceweight 2-ply. 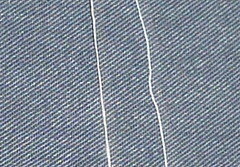 The other is commercial sewing thread. Guess! No cheating by looking at Flickr first to find the answer. No cheating by scrolling down. Margaret Stove is ZOMG THE BEST TEACHER EVER, YOU GUYS. For serious. For reals. For really, really reals. I had never had a good experience spinning 100% merino at a wheel — any of my wheels — before this. It sits in my stash and laughs at me when I come to pet it and think wistfully how pretty a spun yarn it would make. It smirks and chortles. It snickers as it tells me, “Ha, you know you can’t spin me. I drift apart when you look away for ONE TINY SPLIT SECOND. I do it on purpose!” I can spin it on a spindle, but it still snickers and laughs because it knows that I want, like, 1200 yards of it, and with the spindle it takes me six weeks to make six inches. Merino is my enemy. She passed out a sample of gossamer-weight yarn she’d spun. 50g. 500m. 2-ply! IN. SANE. She handed us locks of this astonishingly soft, 3″ stapled 15-micron merino that she’d hand-washed for us, and we opened them up, and broke off the tips, and fanned them out, and we spun them tip-first because that way you don’t get pilling. And we did it on OUR HIGHEST STANDARD WHORLS, the big fat ratios – 10:1! I spun MERINO COBWEB WEIGHT on 10:1! 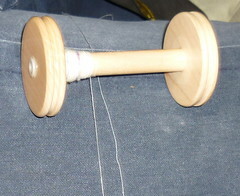 She even told us not to bother getting out our fancy fast laceweight whorls, we were going to spin this on the same setup we’d spin DK on! And I totally DID! It didn’t drift apart once! It just worked! Check it out! #1 | Written by Angel on 14 November 2015. #2 | Written by http://www.ionicbathfootdetox.com/ on 28 April 2016. #3 | Written by http://www.rab-jeric.com/ on 30 April 2016. #4 | Written by http://insure.liquorisquicker.net/gmb_car_insurance.xml on 20 July 2016. Wow! I know exactly that feeling of a shiver down the spine when you stumble across a gem.I often get it just checking out the latest post at Global Groove!Congratulations on your finds – and thanks for your generosity in sharing them all with us loyal followers!As for which to post next…hmmm…Disco Fuentes? Jonah Moyo?…Syliphone?…sounds like any of 'em will be great. You choose.You deliver, we shiver!